Have you ever visited an Irish Castle? Nowadays, some are mountains of ivy-covered rubble – while others are beautifully restored houses and museums. But, all of these castles and tower-houses have a history – and that history is usually intertwined with the history and genealogy of different Irish families. Just this morning, I took the car to Ballincollig – our local town – to get two new tyres. Instead of waiting, I decided to go for a walk and noticed the turret-like tower of Ballincollig Castle glowing across the fields. So, out with the camera-phone and half an hour later I had captured some nice early-morning shots of the ruins of this wonderful Norman castle. Ballincollig castle has been associated with many Irish names down through the centuries – perhaps your Irish surname is among them? 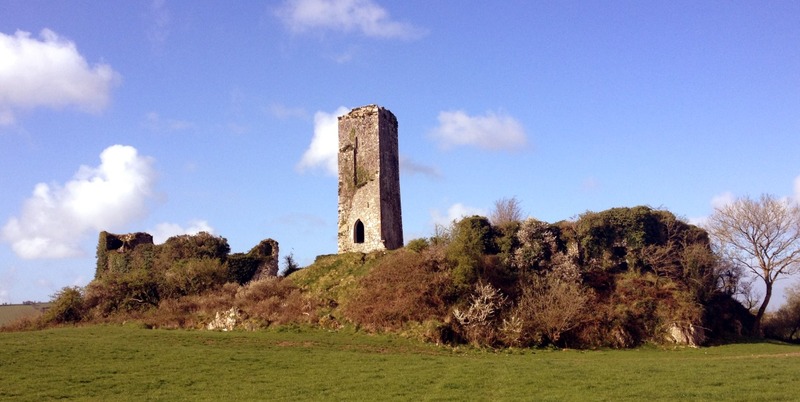 The person who built the castle was probably a Norman knight called Robert Coll – a family who also give Ballincollig it’s name – Baile an Choillaigh (town of the Colls). However, it is mostly associated with the Norman Barrett family, who lived here since the 15th century (another branch of the Barretts made their way to County Mayo where you also find the name today). They were originally underlords of the Norman de Cogans (also known as Goggin) but by the 15th century were probably completely “hibernicised” and were now underlords of the McCarthys. But time – and one’s overlords – move on, and they were later overseen by the Earls of Desmond – the Fitzgeralds. In the early 1600s, the Barretts lost Ballincollig Castle to the Coppingers of Cork – local moneylenders with a Viking heritage. The castle was wrecked by Cromwell in the mid 17th century and never really used again except as an occasional garrison. Finally, the keep of the castle was somewhat restored by the Wyse family and a shield inserted with the monogram W with the date 1857 beneath it. One castle – with lots of coming and going over the centuries – but a lovely place for a walk on a nice sunny spring morning. Question: Are you aware of any Irish Castles associated with your Irish surname(s)? My grand mothers last name was Clancy. They were raised in Kilworth. I was told years ago that the Clogleigh Castle in Moorpark was somewhere in our family line. My Great Grandfathers last name was Savage. He was from the County Down. I found a picture of a castle in County Down that was Originally called Castle Savage. Can you tell me anything of this? Hi Bonnie, there were a few castles in County Down belonging to the Savage family where they were lords. Mike. My mother’s maiden name was Cashell (Cashel with 2 L in Ireland).